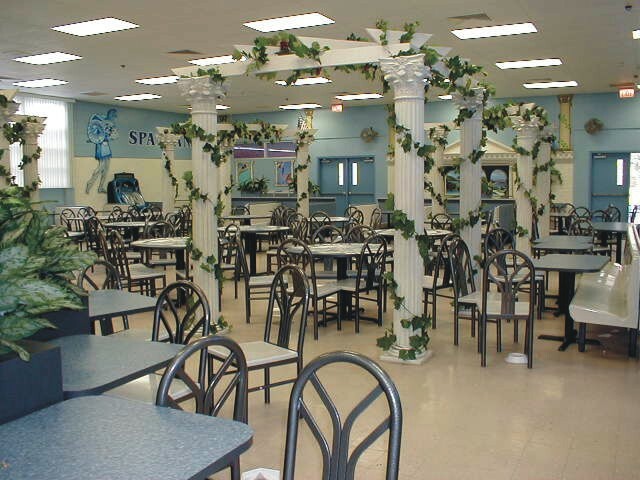 A Grecian temple theme for the Spartans with lots of greenery throughout the room. A large temple style kiosk holds 2 TVs to show school news broadcasts and highlights of sporting events. 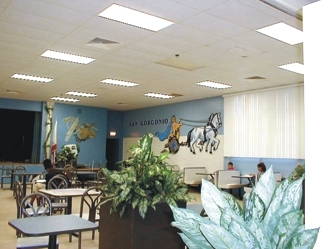 The school Spartan mascot logo is inlaid in the tabletops. A huge charioteer school mascot on the wall, with lots of beautiful green plants around the room. The Spartan theme is shown in this room with greek columns and tables with inlaid logos in the tops. A colorful jukebox provides music for the students and controls the noise level — kids don’t talk above the music!